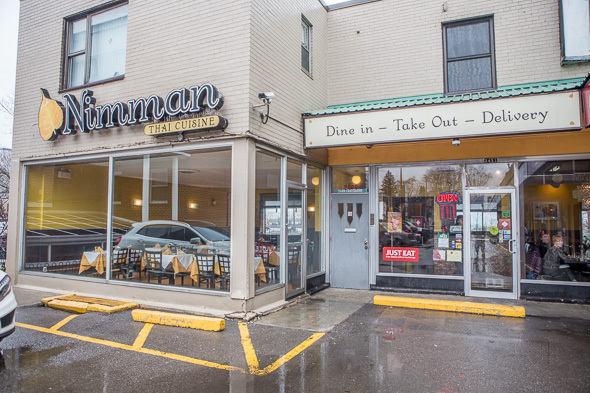 Nimman Thai Cuisine can be found in a small strip mall in Mimico. 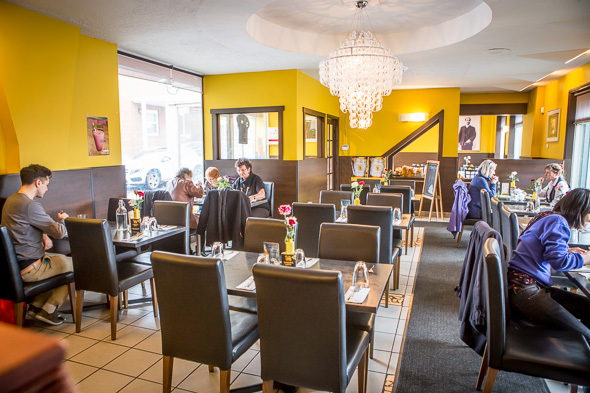 This 80-seat restaurant has been around since 2013, and, like any true Thai establishment, there is a photograph of the king of Thailand up on the wall. 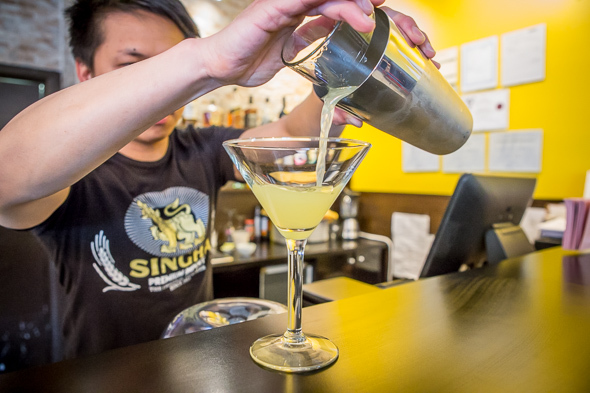 Co-owners Chaowana "Ping" Chaijaroenphinitkul and chef Rujipong Boonyuen are originally from Bangkok, and Boonyuen is actually part of the fourth generation of a family that prepared food for the Thai royal family. Ping tells me he is self-taught, like his mother was. When we visit on a weekday, there's a young woman sitting at a table assembling over 200 spring rolls, prepping for an onslaught of future orders. It appears they do a brisk take-out and delivery business here, which is understandable since lunch specials start at $8.95 and come with a soup of the day, one of the aforementioned spring rolls plus a green salad. For those who dine in, a few boozy cocktails and imported beers like Singha and Tiger ($5.75), along with domestic ($4.75) and premium ($5.25) options, are available to accompany meals, but I'm always partial to the non-alcoholic drinks at Thai joints. Of course, there's the ever-reliable Thai iced tea ($2.50). 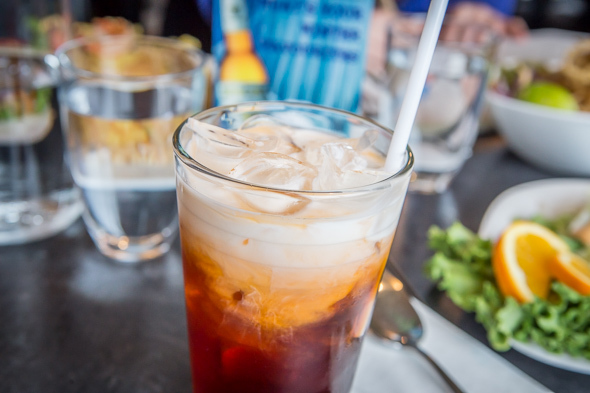 However, there are also some alternatives here I've never tried before that intrigue me, like Thai iced coffee ($2.50), with the coffee imported from Thailand. It has a nice hint of smoky flavour to it that I like, and now I think I may make this my regular go-to instead of the tea. 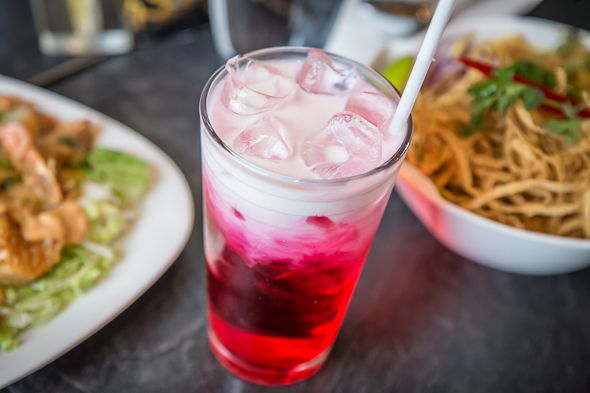 There is also a drink called "nom yen" ($2.50), which is a pink, strawberry-milk-like iced drink that contains a super sweet tropical fruit syrup called "sala" mixed with milk and cream. It's sold streetside in Thailand and is popular with kids and teens, likely because of its bright colour and high sugar content. 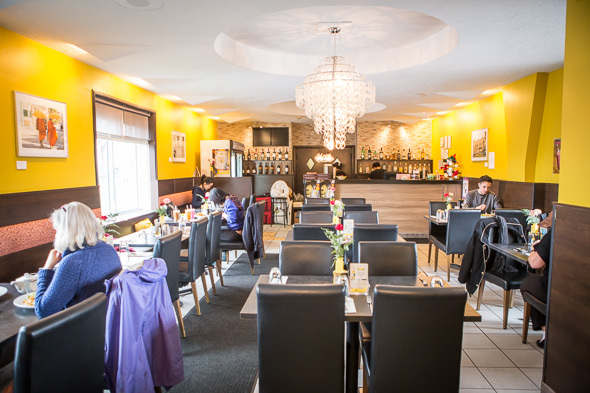 As for food, the menu has all the standard faves, from satay, soups and salads to fried noodles or rice and every curry colour. We start with choo chee shrimp ($13.95) - sauteed jumbo tiger shrimp with a curry sauce of Thai chili paste, coconut milk, kaffir lime leaves and sweet basil leaves poured over top - it makes a tasty first impression, as the sweet-salty-spicy-and-creamy combo of the sauce proves to be addictive, especially on the crispy battered shrimp. 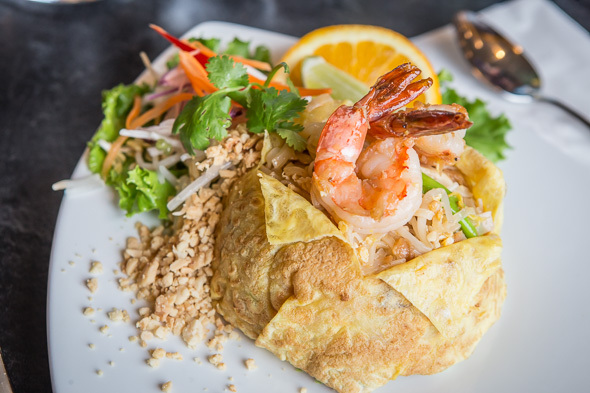 From the three different kinds of pad thai to choose from, we get the pad thai hor kai ($13.95). The two other kinds are a "regular" version with your choice of protein ($10.95-$12.95) and one that comes on a crispy wonton ($13.95). For the hor kai, stir-fried Thai rice noodles with sliced chicken breast, jumbo tiger shrimp, egg, bean sprouts, red onion, sour turnip, crab oil, coconut milk and Nimman's tamarind sauce are wrapped in a thin "bowl" made of crepe-like egg. I feel like it's missing spicy heat, but that's a personal preference. Khao soi ($13.95), on the other hand, has the perfect amount of spiciness to it. The egg noodles in coconut-milk enriched yellow curry come with chicken or beef and are topped with fried noodles along with shredded pickle, red onion and a lime garnish to keep things bright and interesting. 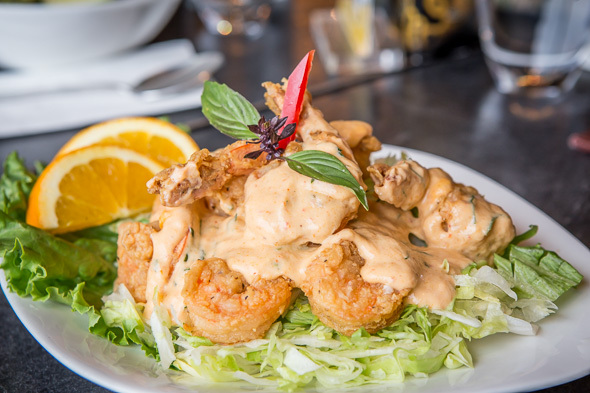 Authentic Thai food in Toronto has definitely come a long way over the past decade, and that's definitely something to be happy about.